Making your own RV gutter spouting is a wise way to preserve the integrity of your mobile home. Gutters are designed to transport rain water away from a structure to prevent leakage, mold and other additional damage. Tacking a gutter and spouting onto an RV will increase the value of the structure and enhance its aesthetic appeal. Purchase gutter parts at any local home supply store and mount the spouting by yourself, or with the help of a friend, over a leisurely weekend afternoon. Install a gutter spout onto your RV before a long road trip. Slide on a pair of work gloves and safety glasses to protect your skin and eyes. Measure the pitch of your roof. Pitch is the determined as the vertical distance between the ground and the roof over a 1-foot horizontal distance. For example, if your roof raises 6 vertical inches per 12 horizontal inches, your roof requires a gutter with a pitch measurement of 6/12. Measure the length of your roof from end to end. Measure the distance from the edge of your roof to the ground. Double the dimensions to equal the amount of gutter material you require. For example, if your roof is 18-feet-long and the vertical distance is 10 feet, you will need 36 feet of gutter and 20 feet of downspout materials. Doubling the dimensions accounts for the total gutter materials needed for both sides of the RV. Cut your gutter and spouting material to the required lengths. Smooth the edges of all pieces with an abrasive sanding pad. Place the lip of the gutter flush beneath the underside of the roof edge. Screw the gutter into the roof using three-eighth inch screws. 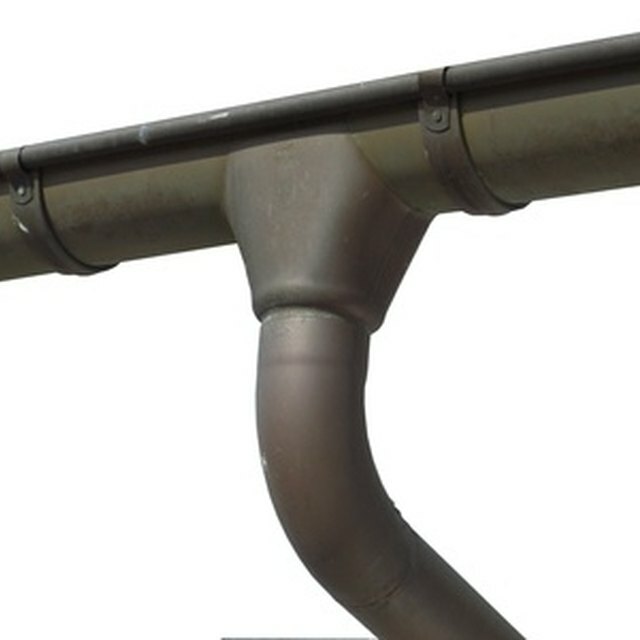 Attach corner connectors to the gutter as necessary to account for any roof bends. Press end caps onto the ends of each section of gutter. Insert a 3 by 4 inch elbow onto the top end of your down spout. Slide the open end of the elbow onto the underside of the gutter. Press the down spout flush against the RV side. Attach a metal gutter bracket hanger to the RV every 6 to 8 inches down the length of the spouting using a drill and three-eighth inch screws. Hangers keep the spouting intact and prevent it from moving or collapsing. Insert an elbow onto the lower end of the spouting to angle running water away from the base of the RV. Place a splash block underneath each section of spouting when the RV is parked.